Today a friend asked me if I had any cute ideas for party favors for a baby shower coming up this Sunday. Such a fun,cute and creative idea! Your guests will sure to take notice! Take one Lifesaver and apply a thin layer of frosting around the inner hole. 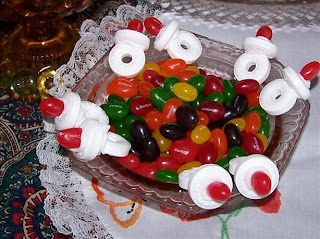 Grab a jellybean and place one of the short, ROUND ends in it, so the length of the jellybean is coming out of the hole. On the other side, take the frosting and make a slightly thicker (yet still on the thin side) layer of frosting around the inner hole/center, and place another Lifesaver perpendicular attaching edge of 2nd Lifesaver to center of 1st Lifesaver with jellybean attached to it. Place on flat surface and allow to dry. After drying for 3-4 hours, thread ribbon through the hole of the 2nd Lifesaver and tie in a knot.